Holidaying on Cape Cod is geographically the width of the Atlantic and experientially a million miles away from the sun, sand and sea package of the Canaries. You take the same basic ingredients, but the mix comes out completely different. For a start, ‘wildlife’ has a completely different meaning. A far cry from the wild nightlife of the sunseekers’ islands, the peninsula offers an opportunity to get in touch with nature. The typical Cape Cod holidaymaker is probably looking for relief from the life of the city, or high summer continental heat. They want to sail or to cycle bicycles down narrow country roads, ramble the beaches and explore nature along the shoreline. Not for them the high rise apartment block with a beat-thumping nightclub downstairs. Typically, they come here with their family, and may rent one of the pastel coloured clapboard houses between their extended family. The Cape’s 15 towns spread out along the 65 mile long flexed-arm shaped peninsula, plus the neighbouring islands of Nantucket and Martha’s Vineyard, have almost iconic status this side of the water. Hyannis, the Kennedy family summer retreat, Chatham, Truro, Falmouth, Provincetown and Brewster, all sound familiar to us. Beaches, golf, shopping, antiquing, walking, birding, biking, fishing, kayaking, lighthouses, seafood, history, salt air, windmills… this is what makes Cape Cod possibly the most treasured New England holiday location. And that accent…. Barnstable becomes ‘baahn stubble’, Yarmouth ‘yaahmyth.’ Utterly charming. Sand stretches for eight miles off the elbow of Cape Cod, forming the barrier islands of North and South Monomoy. Here, among the varied habitats of oceans, dunes, freshwater ponds, salt and freshwater marshes lies the 7,604 acre Monomoy National Wildlife Refuge. Established in 1944, the refuge provides an important resting, nesting and feeding habitat for migratory birds. The lighthouse at Monomoy Point is one of a series of pretty lighthouse along the Cape that were once important navigational aids, but now serve as tourist attractions, adding character to the landscape. Nearby Chatham lays claim to being the most picturesque town on Cape Cod. Anchored by the historic Chatham lighthouse, Chatham’s strolling Main Street is an exclusive mile of boutique shops, art galleries, and restaurants. Located on the “elbow” of Cape Cod, Chatham is surrounded on three sides by water — Pleasant Bay, Nantucket Sound, and the Atlantic Ocean, which means that Chatham benefits from Mother Nature’s “natural air conditioning” with comfortable summers, exquisite autumns, and mild winters. Chatham has carefully preserved the charm and style of a small New England town, creating an ideal destination to experience that “stepping back in time, olde Cape Cod” feeling. The wood-fronted Chatham Wayside epitomises that golden days’ charm, with its chintz bedrooms, open fires and friendly atmosphere. See www.waysideinn.com for more information. There is a particularly well stocked bookstore on Main Street, the Yellow Umbrella, catering for a broad range of literary tastes – they might even buy your books back when your holiday ends. The town celebrates its sense of place through well-loved summertime traditions such as free Friday night band concerts, Cape Cod Baseball league games, and a Fourth of July parade that is a Norman Rockwell painting come to life. At Hyannis, you won’t get a glimpse of the Kennedy compound, unless from the sea. Locals respect the privacy of their famous neighbours. But they do report that family members are often seen around the town or out sailing. Thoreau’s beloved beach is now a protected area, by order of JFK. Forty miles of pristine sandy beach, marshes, ponds, and uplands support diverse species. Lighthouses, cultural landscapes, and wild cranberry bogs offer a glimpse of Cape Cod’s past and continuing ways of life. Swimming beaches and walking and biking trails beckon today’s visitors. The National Park Service operates a year round interpretive centre for the Seashore at Salt Pond all year round. Their calendar is crammed with ranger-led activities for everyone, especially children. Wellfleet is a small, quaint artsy town full of friendly outgoing local people, with a harbour full of boats and good restaurants. Back down at the Upper Cape, Falmouth is regarded as the most traditional town on the peninsula. It was settled in 1660 by a dozen Quaker and Congregationalist families from Barnstable and Sandwich fleeing religious repression, who got permission from Plymouth Colony to settle Succanessett, later renamed Falmouth. It was attacked by the British during the American War of Independence and again in the War of 1812. At the Quarterdeck restaurant on Falmouth main street I finally managed to whet an appetite for lobster and clams that had been created many years ago by school friends from Detroit who were seasoned frequenters of Martha’s Vineyard and the Cape. The menu boasts lobster and clams, mussels and calamari, swordfish with anchovy butter, lobster salad sandwich on Portuguese bread. Food is important on the Cape, boiled lobster, steamed clams, baked sweetcorn and potato are the key elements of the prized clambake. Cranberries are everywhere – in the landscape as bogs, in your cereal, salad and your Cape Codder, the local cocktail, a mix of vodka and, naturally, cranberry juice. n Take the ferry to Martha’s Vineyard or Nantucket. Ferries from Hyannis, Wood’s Hole, Harwich or Falmouth. n Provincetown — a world away from the ‘niceness’ of Chatham, with its bohemian atmosphere. n Mashpee Commons: an old Wampanoag (Massachusetts tribe) name given to an open air shopping mall with local specialities. More than ninety tenants. n Woods Hole: the traditional fishing village is home to world renowned woods Hole Oceanographic Institute, Marine Biological Laboratory, NOAA National Marine Fisheries, Sea Education Association and the Woods Hole Oceanographic Institution as well as the oldest aquarium in the nation. Ida Milne travelled to Cape Cod via Boston with Aer Lingus(www.aerlingus.com), staying at the Chatham Wayside Inn (www.chathamwaysideinn.com) and Jury’s Hotel, Boston (see www.doylecollection.com). Cape Cod is linked to Boston by a daily ferry service in summer, see www.provincetownfastferry.com. 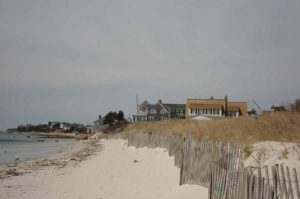 For more tourist information about Cape Cod see www.capecodchamber.org/ or http://www.massvacation.com/capeCod.